GJP Floor Sanding Surrey is proud to be member of Junkers Approved Contractor where past clients have the option of rating them with a score out of ten. Junkers Approved Contractor allows new customers to research the workers they are considering employing as well as to rate past workers highly or lowly, depending on their performance under the following headings: tidiness, timekeeping, courtesy and workmanship – all essential aspects of a trader’s labour. 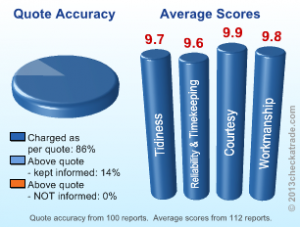 As well as giving them a score out of ten, clients can leave a comment describing the work. There is also a company profile of GJP Flooring on Junkers Approved Contractor.com, complete with company information and insurance information. References from customers and other companies are viewable on the site and all information is kept updated. During and after photos of work completed are available to view on the Junkers Approved Contractor website. Junkers Approved Contractor has been running since 1998 and have received nearly 650,000 customer reports. It began as a way to help customers avoid rogue traders and get the high quality work they deserved for their payment. The three-way partnership between businesses, clients and Junkers Approved Contractor has led to a monitoring service which defeats swindlers and cowboys from preying upon people needing work completed on their homes. Once a local business, Junkers Approved Contractor has grown over the years into an international service which ensures new customers’ peace of mind. This had led to the formation of the ‘Junkers Approved Contractor Standard’, which ensures that those businesses registering on the site are high quality and will meet the expectations of any clients looking to book them. The Junkers Approved Contractor standard includes being honest and courteous as well as realistic on both starting dates and the length of time the job is going to take. 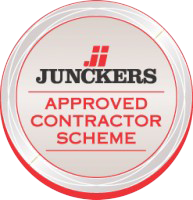 Junkers Approved Contractor is an independent service which puts any companies joining the site through a rigorous vetting process. Junkers Approved Contractor standards also oblige trade and services companies to keep clients aware of the process as they work and to create a separate, signed contract on the occasion of any changes to the original contract – and require that they do not begin any works which will incur costs further to the original contract without discussion with their client. Any companies registered with Junkers Approved Contractor must never ask for cash on hand and must deal with complaints both professionally and promptly. GJP Flooring has been on the Junkers Approved Contractor website since September 2011 and is recommended, vetted and monitored by Junkers Approved Contractor.com. Visit GJP Flooring’s Junkers Approved Contractor profile call the Junkers Approved Contractor trade appraisal telephone line on 0845 408 4866 to find out more about GJP Flooring.